Friends, the holiday season is upon us. When social media fills with adorable babies in really hot costumes, families in the pumpkin patch, Thanksgiving lists and hashtags, and then our mailboxes overflow with cards displaying smiling facing of families in their Christmas Card best. And it is so lovely and beautiful. But it is also incredibly lonely and broken. Those Christmas mornings with presents being ripped into by eager, little hands, screaming babies forcibly sitting in Santa’s lap, pretty coordinating outfits and precious matching pj’s, it all wonderful and it is all equally painful. Especially for those who are feeling emptiness. In my life, the strongest season of that emptiness was during those years my arms ached with actual emptiness as we waited for God to grow our family. For others, that emptiness comes after the death of a spouse, as they sit at the hospital bedside of their sick child, as they wait for a precious call from a deployed sister, as they miss the children spending the holidays away from the mantle on which their stockings still hang, as the wife laying next to her husband wondering what has gone wrong in their marriage. Emptiness comes in every form imaginable. This broken world seeps into our lives leaving us lonely and empty when we expected only love and fulfillment. For me, as a childless mother, waiting for God to fill the emptiness in my arms and in my soul, the entire year of trying and failing every.single.month to grow our family got rolled into one big ball of pain during the holidays. No matter how hard I have tried, I simply have not been able to get over that pain. Even the joy and excitement and the miracle of my own two babies has not completely taken away the sting. And, I suspect, that’s because I know there are so many women feeling all of that every year. All of them, like I did, waiting for New Year’s Eve and praying that new year brought something drastically different than the current one. My heart breaks for all those who are still waiting for their children and for those who gave up the waiting years ago. I can feel the sadness and pressure and grieving this time of year hanging in the air like humidity in the South. And it knocks the breath flat out of me. Today, I want to look at that emptiness. Hold it up to the Light, the Truth of God’s word, and see what our Savior says about this thing inside of us, this pain, this longing. Several years ago, I remember hearing someone offering comfort to infertiles by sharing that not once in scripture did a woman pray for a child and God withhold that from her. Every woman in scripture who asked God for a child was given a child. I don’t know if that’s true or not. I took it for what it was, a comforting word to a room full of grieving women, but never felt like proving it for myself. At the time, I clung to her words. Probably even repeated them as truth. As people do in the midst of emptiness, I reached for any word to try and fill up. With age and experience and bearing witness to women in my life who do not have and may never have children, I am left with more questions than answers. I know God is good. He is literally good. All good everywhere is God. There is no beautiful sunset, no delicious meal, no tranquil stream flowing that is not God-created, God-breathed. How do I reconcile His goodness with the pain of childless mothers? But my faith trusts His goodness is true even in the middle of our worst grief. Because I know I cannot see everything. I can only see this very moment. And I cannot see all the ways these amazing, selfless, worthy women will mother in their life. 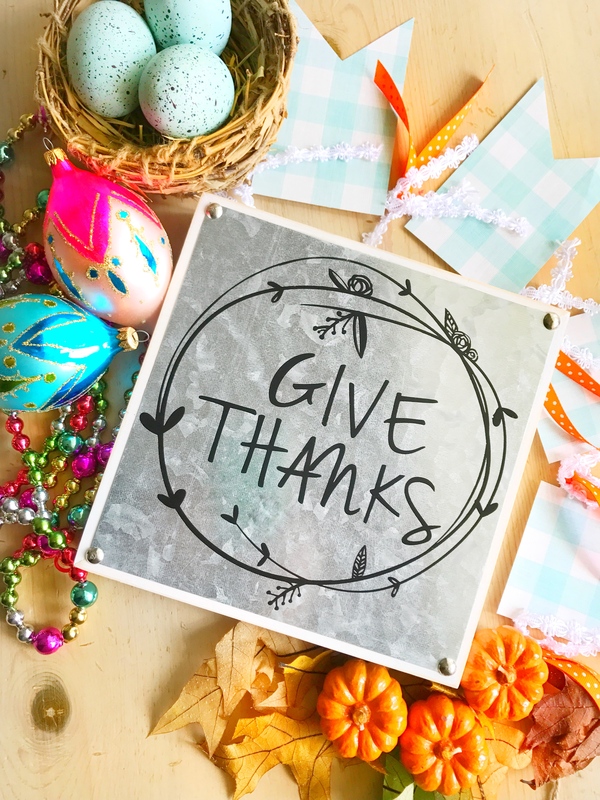 Sisters, Mothers-in-Waiting, can I offer you some words of love and appreciation from my heart? Because you? You might just be in need of some truth from God’s word. And not a false hope but an honest, true purpose. Let’s start with that truth. You may never have a biological child. You may never adopt or foster or have a surrogate. Rather, you may mother in ways you never expected. As a spiritual mother, world’s coolest aunt, best godmother ever, mentor to a niece, beloved teacher. There are a million ways to mother, to nurture, to guide. And thousands more children who need women to fill those roles. Maybe the choice is yours and maybe the choice is made for you. Either way, it feels like a whole big mess and you’re not entirely sure you want anything to do with all that. You’re not interested in mothering differently. Not interested in even considering that. It feels hard and messy and complicated. And for sure, this world is overrun with straight up hard, complicated mess and sometimes, we just find ourselves surrounded by it. But you are not the mess. Even if you feel it sometimes. I love reading about the moments Jesus met individuals in a mess. But I especially love reading about the man who was blind since birth. First, I love that John wrote about him as “a man blind since birth.” Not a “blind man.” We do that as a society now. We are careful to refer to a child on the spectrum as a “child with autism” and not an “autistic child.” Their identity lies in their humanity, not in their diagnosis. Neither did this man’s blindness change his humanity. Society said it did. Even his parents were not caring for him. Culture, tradition, fear said he had to sit outside the temple and beg. Said he was unclean. Unworthy. Unseen. But Jesus knew the man’s identity. His humanity. And then, the disciples. Oh, how I adore them and their mess of a messy life. So, hey Jesus, who’s to blame for this guy’s blindness? I mean, he was born this way so somewhere somebody messed up. Who was it? His parents? Or was this guy punished in advance for the sins You knew he was GONNA do in this life? Do you ever feel like the world asks those questions of you, friend? Oh! You don’t have children? So…who’s fault is that? What in the world have you done in this life for God to punish you like that? And you’ve felt that before, right? You’ve racked your brain and plundered your every memory looking for that unconfessed sin you can get right with God and move on to having children. Only, you know the truth. It’s not about punishment. But that feels like a plausible “why” when you can’t seem to find another one. So, is there another why? Maybe? Let’s see what Jesus says. Y’all. Nobody sinned here. Not his parents. Not him. This man is blind SO THAT God’s miracles might be put out on display for the world to see. His blindness had a purpose. How about you are not holding your own children right this very minute SO THAT God’s miracles will be seen in your life? Could it be that you are meant to mother differently SO THAT God’s works will be shown to the world? God’s work displayed in you? Are you ALL IN with that? Does it get any better? God has a plan for your life. TO DISPLAY THE WORKS OF GOD. I don’t know how healing will come to this place in your life. I wish the answer was as simple as, well, it worked for everyone else. But we both know it’s not. Because you, friend, are not like everyone else. Your life was beautifully, perfectly, specifically created by I AM. He who was and is and forevermore will be. He chose you. He placed you in the exact place you are. To display His works. I can’t imagine a better purpose or calling. Friend, this season when you feel like you are drowning, surrounded by women and families and children celebrating and rejoicing and you feel like you are not even worthy to experience that celebration, don’t believe that lie. You were created, your struggle allowed, your life ordained to display with works of your good Father. Embrace that truth. Hold onto it. Buy yourself some flowers, write it on a card, and put them on your table. Walk by those words a thousand times this season and repeat them to yourself. Let them take root in your heart. You were created to display the works of God. Oh, friend. That is worth the best celebrating you have ever done. Thank you, Lord, our kind, gracious, good Father, for the works you have done, are doing, and will forevermore do in the lives of childless mothers. Lord, you have heard the cries of their hearts. Even when they cannot find the words, we know the Holy Spirit has taken their anguish to You for them. And today, today, we are holding fast to Your words. That You created them to display Your works. Works we cannot see from here. Works we know are coming. Works You have already called them to. And we are humbled and grateful. The victory over this pain, this grief, this heartache is already done. It is finished. Thank you, Savior, for that victory. For whatever it looks like and however it comes. We stand free in Your completed future for us. 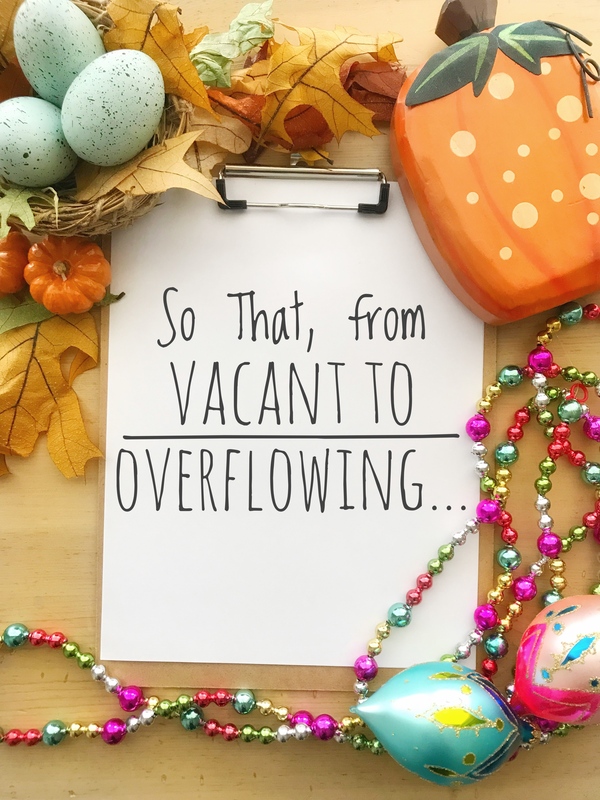 And we say, what we once called “vacant” we now call “overflowing.” Grant us Your eyes to see just how full our lives are of Your works.